MIAMI (Sporting Alert) — NBA standings and team records after the games that took place on Tuesday night, April 8. The following are the latest NBA scores and results. At the Sleep Train Arena in Sacramento, Kevin Durant’s streak of scoring at least 25 points in a game ended Tuesday night, after he scored 23 points in the Thunder’s 107-92 win over the Kings. Durant’s streak of scoring at least 25 points stopped in 41 consecutive games, but it seems he decided to end the run voluntarily after sitting out the entire fourth quarter. The Oklahoma City (56-21) star forward felt it was becoming a distraction. “I was getting so many texts after every game. 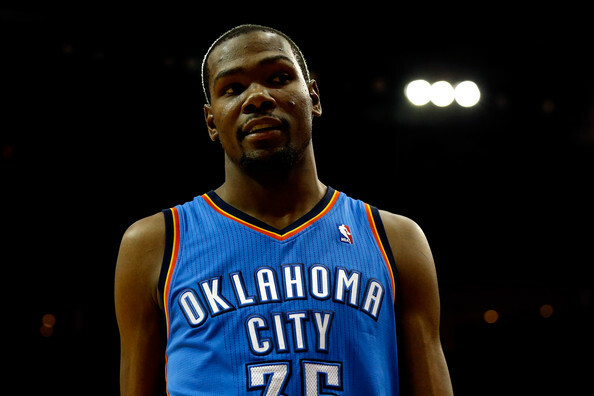 I’m glad that’s over with and we can just focus on the team,” said Durant. “If we played well and I had 25 points, that took away from how well the team was playing, so I didn’t like that. Over in Miami at the AmericanAirlines Arena, Mason Plumlee made a crucial late block of LeBron James and the Brooklyn Nets (43-34) edged the Heat 88-87 and complete the season sweep of the two-time defending champions this season. Elsewhere, James Harden had 33 points and 12 assists and Terrence Jones added 33 points as the Houston Rockets (52-25) picked up a 145-130 win over the Los Angeles Lakers (25-53), who dropped their fifth straight game.